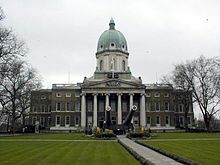 Imperial War Museums was founded as the Imperial War Museum in 1917, the museum was intended to record the civil and military war effort and sacrifice of Britain and its Empire during the First World War. The museum's remit has since expanded to include all conflicts in which British or Commonwealth forces have been involved since 1914. As of 2012, the museum aims "to provide for, and to encourage, the study and understanding of the history of modern war and 'wartime experience'". This article uses material from the Wikipedia article "Imperial War Museum", which is released under the Creative Commons Attribution-Share-Alike 3.0 License.